Healthcare institutions already face a variety of security challenges both physically and in the digital space, and these of course will only continue to evolve. As this happens, the security industries must keep up with change. Particularly vulnerable to data breaches and ransomware are hospitals. This is due in part to the relatively high value of medical data. Besides this, most modern facilities and doctors now use electronic prescriptions which can be vulnerable to fraud and theft. Hospital administrators are under the pressures of a cost only alleviated through the improvement of operational security and workflow efficiency. Here we will look at some ways to accomplish that. A key component in overall healthcare securities is knowing who is going where and when within the different zones of the installation. One way to accomplish this is using “Trusted Identities”. This approach to identity and authentication uses multi-factor authentication, digital certificates, management of credentials, and physical security in a four-pointed approach sometimes called PIAM. 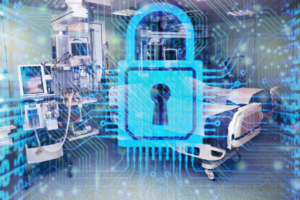 Reliable and efficient credential verification has given rise to a more connected and efficient system for hospitals in what is called the IoTT (Internet of Trusted Things). This also opens the door to making use of big data and machine learning to create fundamental changes in how healthcare institutions manage risk and operate in general. Regarding electronic prescriptions, the DEA mandate for a separate two factor authentication for controlled substances is one out of many regulatory requirements facing the digital arm of healthcare. Intelligent systems built to automate much of this type of “red tape” can realize significant decreases in cost. Using integrated systems that can talk to each other will almost always result in better efficiency, done properly. Digital certificates, signatures and signing are backed by public key infrastructure and can incorporate One Time Password (OTP) tokens and biometrics to comply with both DEA and HIPAA. These same systems can be used to solve the fundamental issues of protecting patient data and remotely authenticating through VPNs using mobile devices. Perhaps the most promising up and coming weapon in fighting healthcare fraud like malware and data breaches is real-time risk profiling, which protects against both known and recent threats targeting both online users and mobile devices. Risk profiling in the healthcare setting can use a wide variety of known information to make best guesses about a subject trying to gain access to some device in the network. These data driven cyber surveillance systems combine evidence-based approaches to risk analysis with behavioral biometrics to give the best picture of the real risks to an institution, much in the same way big retail chains can guess who is about to steal from a store. Security Technology of South Texas is happy to offer custom access control and surveillance solutions to the healthcare market, designed either turn-key and from the ground up, or integrated into an already existing series of cameras. Security Technology of South Texas, Inc. is happy to introduce our newest member of our sales and design team, Roxann Corralejo. Roxann comes to us with a successful history in professional sales, and already she has achieved sales well beyond her initial objectives as she has helped several businesses protect their property and employees with our unique security solutions. Welcome to the STST family Roxann!! !